Hi lovelies! As many of you will already know, last month, I started a campaign called Bloggers Against Cancer, which you can check out here https://www.justgiving.com/bloggers-against-cancer/ (there is also a page at the top of my blog where you can check out the full details of the campaign), as I think the Blogging community can really make a difference. A community as big as this one is powerful and if that power can be used for something as amazing as helping a cause as incredible as Cancer Research, then I think we should do so. There's been a lot of support for the campaign so far, some very generous donations and lots of Shari on social media and I just wanted to do a quick post to say keep it up! 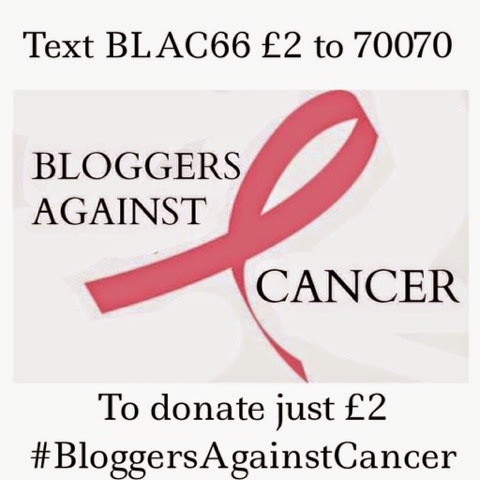 Sharing the campIgn using the hashtag #BloggersAgainstCancer will help massively as it will help to spread awareness of he campaign, therefore bringing in even more donations, edging us one step closer to our £1000 goal every single day! If each and every one of you reading this post donated just £2 and shared on your Facebook, twitter, insta grams etc, think how much of a difference that alone could make. Every single donation counts, no matter how big or small, every share counts, every time you let someone know about the campaign, we can make a difference bloggers, so let's show everyone what we can do! Please share this post and the just giving page with your followers and even better if you'd like to write a blog post on the topic! I am also planning to do a #BloggersAgainstCancer fundraiser in the new year, so definitely share any ideas you have in the comments as I'd love to hear them!